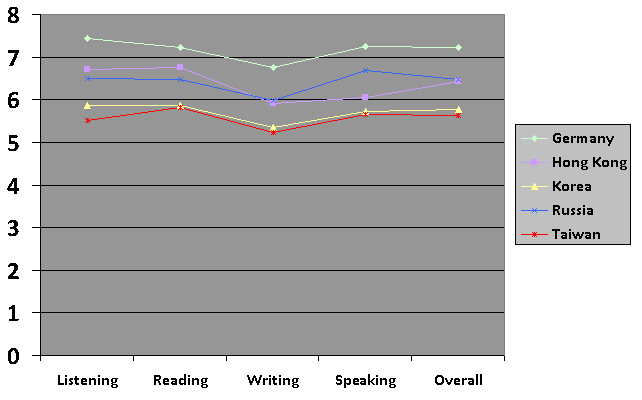 The chart shows information on average IELTS scores in 5 countries in 2006. Overall, we can see that, students in Germany achieved the highest grades, being awarded around 7.2 on average. Of the featured countries, students in Taiwan and Korea did the least well, with average grades of just under 6. Interestingly, students in all the featured countries did least well in the written test, generally scoring about half a band lower than in the sections. From the examples provided, it seems clear that students in European countries did better in the test that those in East Asia, possibly because of the greater similarity to the students' first language. An exception to this is Hong Kong where students were awarded very similar scores to their Russian counterparts, each achieving an average of around 6.5, with Hong Kong students doing better in the Reading and Listening papers, and Russians doing better in the Speaking section. The information suggests that Taiwanese students will need to work hard, particularly on their writing skills if they are to be competitive with students from other countries.